At Oregon State University, lecture capture is performed using Crestron Capture HD high definition capture recording technology.Readers of a certain age can perhaps recall that when choosing a college, their search focused on the dorm rooms, the library, and the performance of the football team. Today’s students may still care about some of those things, but uppermost in many minds is how a given school integrates the smart devices that rarely leave their hands into the classroom. Manufacturers have responded to the increase in the ubiquity of handheld wireless devices, especially among young people, with a variety of technologies that enable higher education establishments to allow students to participate in classes from a remote location, to repeatedly view and review classes, and to take part in what are known as flipped classrooms. The schools, for their part, can implement these technologies in order to provide lecture capture, streaming of real-time as well as archived class materials and presentations, and collaboration between not only educators and students but also educators and their remote counterparts. 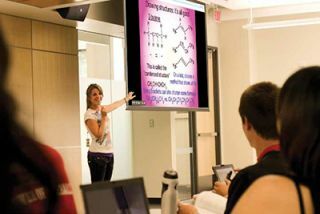 Lecture capture technology has generally been adopted more by further education establishments, including training hospitals, than by high schools—and rarely, if ever, by K-12 schools. “It’s a totally different way of learning,” said Rob Sheeley, president and CEO of Vaddio, regarding the slow uptake by K-12. That teaching paradigm typically involves a real-time, in-person relationship between the teacher and the class. “The challenge is that in K-12 you need to have students who are responsible enough and accountable enough to be able to have remote education and actually be there doing it,” he said. Crestron has developed an easily operated and implemented, licensefree lecture capture system based upon the company’s DigitalMedia AV signal management platform in combination with its CaptureLiveHD, and, typically, Fusion RoomView software, which have been engineered to work together. In addition to the expected recording, playout, and streaming (to an open source media website, for example) capabilities, the package also enables scheduling and room booking via Microsoft Outlook. With controls that are no more complicated than, say, Skype, even a technology neophyte can operate the system. For the integrator or IT department, “The beauty of Capture is that there’s no training necessary. You stick it in the rack, plug it directly into the switch, and off you go,” said DiBella. Haivision, which has been involved in higher education since the early days with its video transmission from multi-room distance learning environments over ATM networks, interactive encoder technology, and Furnace IPTV delivery, has streamlined lecture capture to a single box. “Viper was introduced as a standalone appliance, a totally encapsulated capture, streaming, recording, and playout device, for interactive learning sessions where you might have multiple real-time sources,” explained the company’s chief marketing officer, Peter Maag. A recent product introduction, Calypso, extends those capabilities facility-wide. Higher education institutions are increasingly investing in simulation for skills assessment in interactive learning environments, said Maag. For example, Haivision system deployments include 12 procedure rooms in a Canadian university hospital, a 40-room evaluation deployment for teaching psychiatry skills in another university, and a 13-room speech pathology lab, where the set-up replaced a rack of DVD recorders in a control room into which four professors previously had to squeeze in order to oversee multiple rooms. Not every system depends on hardware. “Lecture capture went from being a hardwarebased device to being a software application,” said Sheeley. “One of the big drivers was Project Matterhorn.” The education-focused open source software offers audio and video content management. WebRTC adoption could be a similar driver. A software-based workflow offers flexibility, he elaborated: “One class might be a lecture capture. The next might be streaming, so they shut the lecture capture application, a new professor comes in, plugs in his laptop and he’s got Quicktime, so he’s set-up for streaming direct to their CDN [content delivery network]. The next guy comes in and wants to bring in a remote professor via Jabber. He brings up his Jabber client and he’s working. Steve Harvey (sharvey.prosound@gmail.com) has been west coast editor for Pro Sound News since 2000 and also contributes to TVTechnology, Pro Audio Review, and other NewBay titles. He has over 30 years of hands-on experience with a wide range of audio production technologies.